Cheryl Harness takes your students to pre-Revolutionary War times to meet this Native American chief. Use this Minute to reinforce the grammatical rules of proper nouns. First, have students identify and list all the proper nouns in this Minute. Then, first in small groups then as a whole group, reach consensus for a working definition of proper and common nouns to hang in your classroom. To extend the lesson and dig a little deeper, explore the confusing cases where the writer has a choice about whether to use a proper noun...or not! Author Harness mentions numerous areas of the US - before it was the US. Get out a large map of the continent and have students identify the location of western Ohio, the Ohio River Valley, Canada, and the Gulf of Mexico. Have students describe Tecumseh’s travels using cardinal directions. Throw in a question about distance for good measure! Look closely at the map to identify the areas that would have been known as the “Wild West” in pre-Revolutionary War days. For a deeper look, check out the westward expansion materials offered by Brown University's Choices program. Share maps (check out this one introduced by NPR in 2014) that indicate all of the peoples that populated these lands before Europeans arrived. Invite questions about why settlers would want to expand and what kind of tensions this would create for the native populations. Use this Minute to explore the Native American tribes by region. Which tribes lived where? Identify cultural characteristics of tribes - housing, diet, recreation, origin stories - and ask students to conjecture how the geographical location might have influenced the cultural characteristics of each group. Here’s a decent resource to use as a starting point. One of the portraits included in the Minute was created by famed American artist George Catlin whose specialty was painting Native Americans in their native settings. Introduce your students to Catlin through the Smithsonian's American Art Museum site which provides an online gallery of his works with detailed back matter. 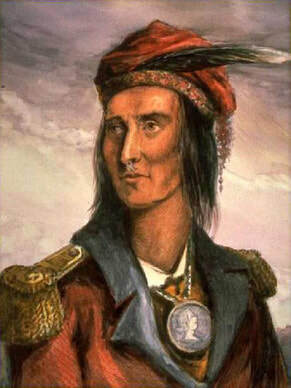 Author Harness tells the reader that Tecumseh was named after an event that occurred near the time he was born. Send your students searching for things that happened the day/month/year they were born using advanced search features in Google that allow searchers to specify dates. Explore these tools in online databases and other browsers and compare results and ease of use. Historical maps are a fantastic way to delve deeper into history. Close examination and comparison of a number of different maps invites inference and encourages critical thinking. Have student explore resources like Old Maps Online, and teach them how to search both geographically and chronologically for information. The University of Texas also publishes an extensive index of online historical maps sites that is worth checking out with your students.